Tony Brandon stumbled upon a screen in Windows 8.1 that he didn’t know was there, listing all of his programs in alphabetical order. He wanted to know more about it. 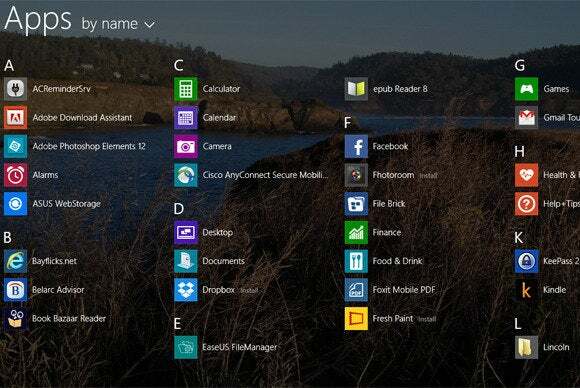 You found one of Windows 8’s best-kept secrets--the Apps screen. Here you can find all of your Metro/Modern apps as well as your conventional desktop programs. You don’t have to rearrange them, pin them, or try to remember where you left them. How you get to the Apps Screen depends on how you do your pointing. If you have a touch screen, go to the Start screen and swipe up from the bottom to the top of the screen. Do it in a place without tiles, such as the left-most edge of the screen. 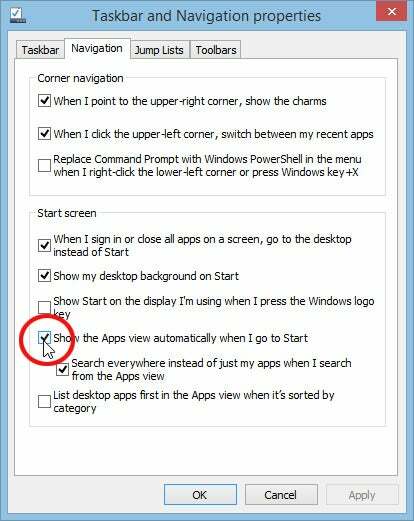 If you’re using a mouse, look for a down-pointing arrow in a circle near the lower-left corner of the Start screen. If it’s not there, move the mouse a bit, or click on a blank spot. Once you see it, click it. The Apps screen defaults to sorting and grouping your apps “by name.” Obviously, this makes it easy to find any app whose name you remember. This screen offers three other sorting options: date installed, most used, and category. All have their obvious uses. The most used option is a favorite of mine, coming close to the usability of the Windows 7 Start menu’s left pane. Not surprisingly, the Apps screen doesn’t treat Modern apps and traditional desktop programs equally. If you’ve sorted by name or category, it will display the Modern apps first, then the Desktop apps. Like the old Start menu’s All Programs section, it gives each desktop program a group of related shortcuts. For instance, the Dropbox section has icons for Dropbox, Dropbox Website, and Uninstall Dropbox. If you sort by date installed or most used, apps and programs mix together. If you like, you can make the App screen your default Metro/Modern interface. In the Search charm, type taskbar and navigation and select Taskbar and Navigation. You can also right-click the Taskbar and select Properties. Click the Navigation tab. Check Show the Apps view automatically when I go to Start. Once the change is made, you need never look at the Start screen again.